The ClientLook commercial real estate software offers a simple solution for sending email to individual recipients using MailChimp templates. This is ideal for standardized follow-up emails or sending brochures without the need for sending a big email campaign. What MailChimp is to mass email, Mandrill is to individual email. Mandrill is owned by MailChimp and allows you to use your MailChimp account to send any of your templates to a single contact in your ClientLook account. 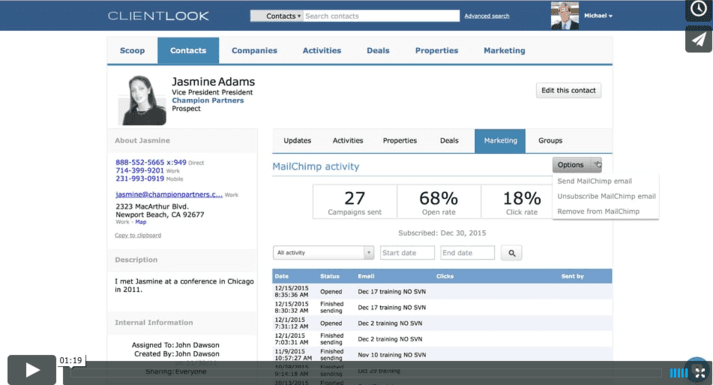 Video: Learn how to connect Mandrill to ClientLook for easy email sending. To set up your Mandrill account, visit their signup page. If you already have a Mandrill account, you can skip this step. Log in to your MailChimp account, then click on your email address in the upper right corner of the page to pull up the account menu. Click “Account”, then choose the “Integrations” tab. Click on “Mandrill” on the left to expose the “Authorize Connection” button, and click that button. Click “Allow” on the Mandrill confirmation screen. Log in to your Mandrill account. Click on the “Settings” button. Copy or write down this API key so that you can paste or type it into ClientLook. In ClientLook, click on your name in the upper right corner of the screen and choose “Setup”. Click on the “Integrations” tab. In the Mandrill section, click the “Connect” link. Paste or type your Mandrill API key in the box and click the “Connect to Mandrill” button.